It&apos;s an ad campaign match made in heaven: Miu Miu has cast Elle Fanning for its Spring 2014 campaign, an image of which leaked onto The Fashion Spot on Tuesday night. 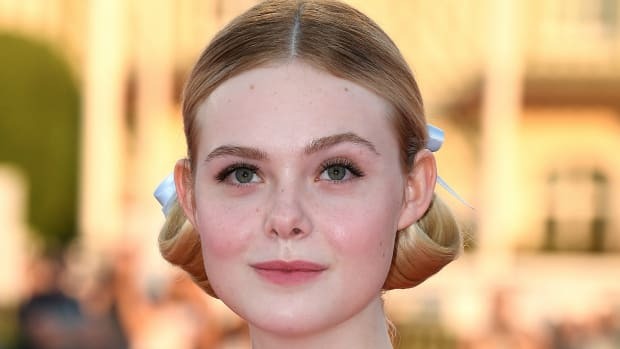 Both 15-year-old Elle and her older sister Dakota Fanning have been huge supporters of Miu Miu and Prada for years -- sitting front row at their runway shows and representing the brands on the red carpet -- and we cannot think of a better face for the youthful brand. For such a young woman, Fanning is already known in Hollywood as a style risk-taker, and she&apos;s also had some high-fashion modeling practice as the Fall 2011 face of Marc by Marc Jacobs, so we&apos;re sure she was a natural. Shot by Inez and Vinoodh, Fanning is following in the footsteps of other starlets who have been featured in the Italian brand&apos;s campaign, including the then-14-year-old Hailee Steinfeld in Fall 2011 and Kirsten Dunst in Spring 2008. Are you loving Fanning&apos;s campaign as much as we are? Update: The full campaign was just released in WWD, and Fanning is just one of four young actresses featured. Elizabeth Olsen, 12 Years a Slave&apos;s Lupita Nyong’o and Bella Heathcote each have a unique ad (check out Olsen&apos;s hippie hair!) that&apos;s meant to correspond with their personal styles. This is fitting, since each one of these ladies gets as much buzz for her red carpet style as for her impressive acting chops. Which one is your favorite? LOS ANGELES--There were dozen of celebs at Tuesday night's Miu Miu party to celebrate the brand's new Noir line of sunglasses, but it was Hailee Steinfeld, the face of the brand and star of that fantastic Bruce Weber lensed-campaign, that sent flashbulbs popping. I caught up with the 14-year-old actress (who spent most of the evening chatting with Tavi Gevinson--new bestie alert?). Steinfeld told us she's "in love" with Miu Miu and feels honored to be repping the label. And as for the transition from acting to print modeling? Turns out it's not so foreign. "It's kind of funny because when I was younger I did a lot of print and then I went more into acting so I had a little deja vu when I went back to it, doing the whole modeling thing again," she said. "I had such an amazing time filming especially working with Bruce Weber." Though the campaign might seem far from controversial--the teen actress is covered up and her poses are hardly suggestive--some critics have taken issue with her age, arguing that she's too young to be the face of a label whose clothes are meant to be worn by and priced for grown ups. Elle Fanning Covers Teen Vogue February 2012, Peep the Adorably Perfect Editorial and Behind the Scenes Video!